M Over at Splitcoast today, we’re doing the Featured Stamper Challenge. I chose this gorgeous card of Deb’s to CASE. While using the same designer paper pack, I did use different papers, used the same poinsettia die but dry embossed it; added a punched layer under the lace and added lace under the brad instead of a snowflake. These papers from My Mind’s Eye are absolutely amazing and so wonderful to work with. 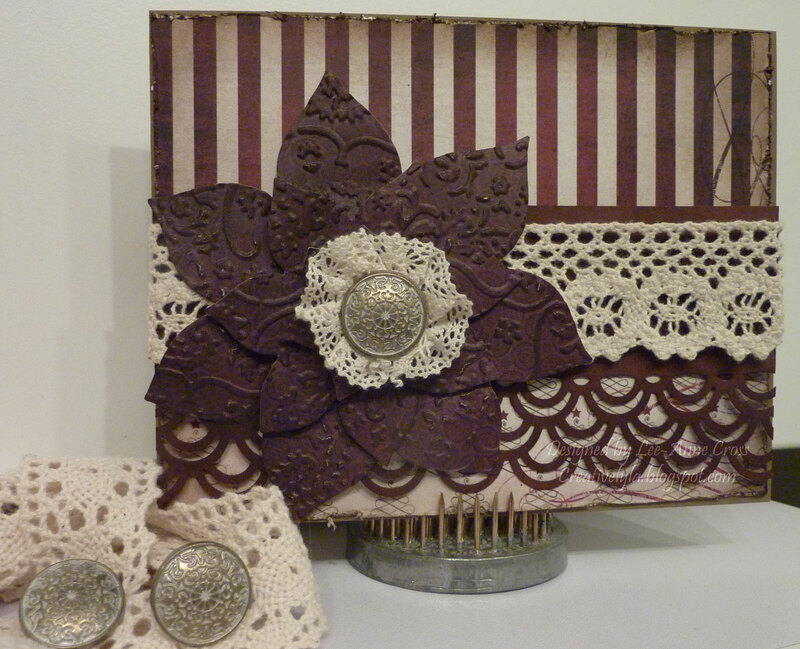 I chose two different patterns for the background, distressed them and sponged them with Stampin’ Up’s Soft Suede. Then comes a layer of Stampin’ Up’s Bravo Burgundy that has been sponged heavily and punched with a Martha Stewart punch. Over top of that, a layer of lace. Once the poinsettia was cut out with the dies, it was dry embossed with an embossing folder. Sometimes when you dry emboss dark designer papers, they end up showing the back side through. In other words you get a lot of light spots. I remedied this by sponging it with the same Soft Suede ink. Then the petals were shaped and dimensionals were added to…you guessed it…add dimension! The brad has a piece of lace gathered and adhered to the back of it before the whole poinsettia was assembled.